In this short interview, Abiquiu´s Pueblo Historian David Lopez firstly talks about trading between New Mexico and California along the Old Spanish Trail and also discusses the major events that have affected the identity of the people that comprises the community of Abiquiu. After meeting with Faustino Herrera de Vargas, a local artist who has painted over 700 churches around New Mexico, I felt compelled to visit the Cathedral downtown. 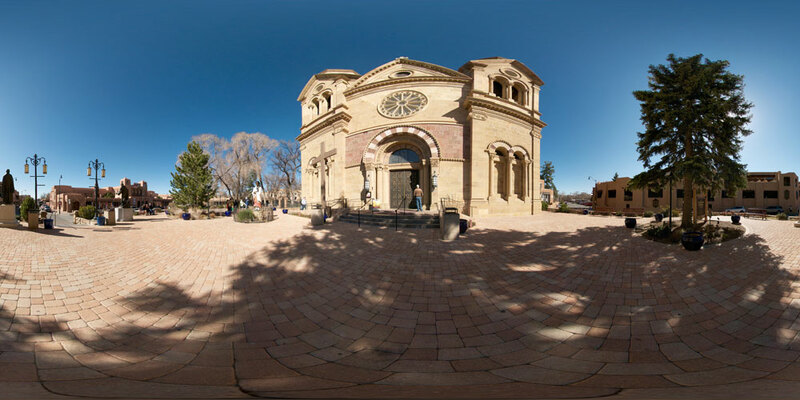 Located near the plaza, Saint Francis of Assisi is one of Santa Fe´s key landmarks. Santa Fe is considered the oldest state capital in the USA as it was founded in 1610, the same year its first church was built. The original adobe church was replaced years later by a newer construction that was damaged during the Pueblo Indian Revolt of 1680. It wasn’t until few years later when the spaniards had already returned to New Mexico that the new church was rebuilt. The small adobe chapel dedicated to La Conquistadora, the statue that arrived to the new world in 1625 with the first settlers, still remains within the Cathedral. La Conquistadora is considered to be the best dressed woman of Santa Fe as she has more than 200 outfits that have been made by volunteers as a sign of devotion.